Though all the restaurants have their own secret spices to make the haleem, it is basically cooked with wheat, barley, lentils and mutton/beef/chicken along with a variety of spices to induce a mouth-watering aroma. The items are put in a bhatti (cauldron) along with tons of ghee and cooked for up to 12 hours under low heat. After the stipulated time the dish reaches a paste-like consistency with minced meat being the most distinguishable item. The dish is high in calories and provides a quick energy rush which is much needed for the people who are fasting. Some restaurants even add dry fruits to enrich it with anti-oxidants. There are also vegetarian versions available for the veggie folks but the traditional ones definitely outscore them in every field. It is then served in Irani bone china bowls sprinkled with dry fruits, fried onions, fresh coriander and mint leaves and sprinkled with lemon juice to add a tangy taste to it. While Haleem originated in Arabia and Yemen, it was first served in Iran as Tabarouk in the mosques during the times of Ramzaan and Muharram. 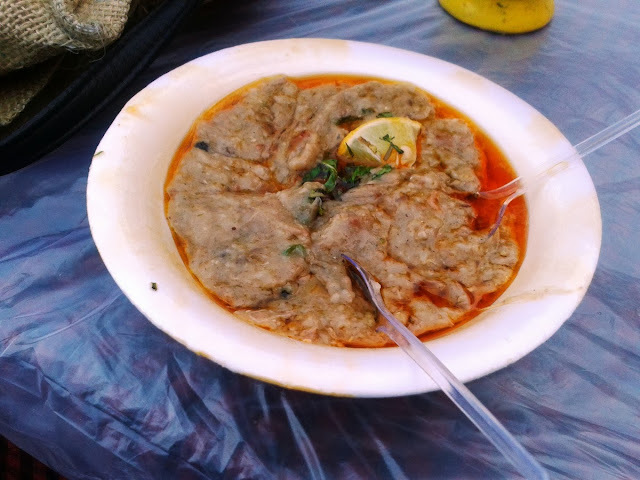 Later after some local modifications in the kitchens of the Nizam of Hyderabad, Haleem became extremely popular among the people of Hyderabad and other areas of South India. Famous restaurants like Sarvi, Cafe 555, Pista House and Shah Ghouse have a fierce competition with each restaurant trying to outsmart the other. Such is its popularity that the restaurants courier haleem all over the world through special courier services. In 2010, it was given a Geographical Indication Status (GIS) by the GIS Registry Office in Chennai; the only non-vegetarian Indian dish to have made the charts. While Haleem might be the Hyderabad's most famous dish, the unifying factor of this dish cannot be ignored. Irrespective of age, religion or location, people come together to share a bowl of this spicy meat-wheat concoction, a true symbol of brotherhood, unity and tolerance. never knew abt the sweet haleem!